The 2008-2009 recession was a significant landmark for the state of pipelines. Prior to this time, the infrastructure was focused on importing products, such as crude oil. For example, the Louisiana Offshore Oil Platform (LOOP) and Capline were completed in the 1970s and 1980s, and these projects were intended to move crude oil from the Gulf Coast to the Midwest. The Seaway pipeline, completed in 1976, was thought to transport imported crude oil from Freeport, Texas to Cushing, Oklahoma and finally to the refineries in the Midwest. In the northern part of the U.S., investments to construct pipelines were made to import crude oil from Canada to U.S. refineries. After the recession, the techniques of hydraulic fracturing and horizontal drilling changed the strategy for developing pipelines. Onshore domestic production began to increase, and companies were trying to move crude oil from non-traditional production areas, like North Dakota, as well as from the existing production areas, to the refineries around the country. 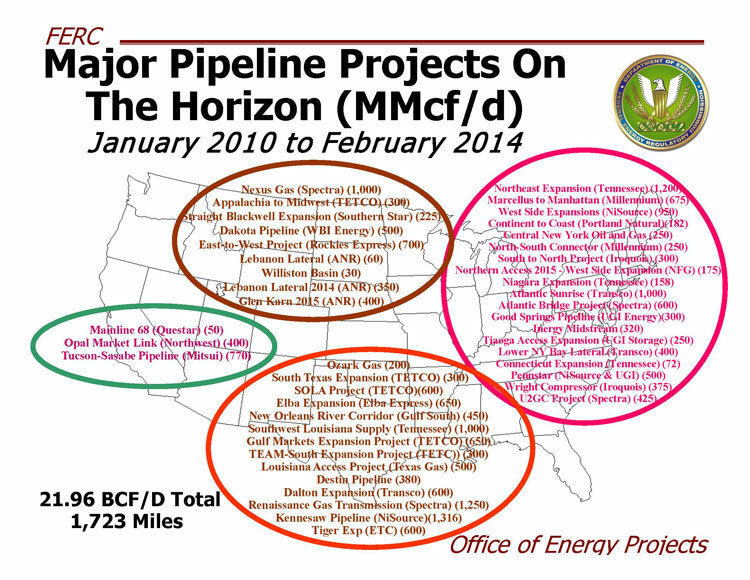 This change led to an increase in pipeline construction, and the above map shows all of the in-service liquids transmission pipelines, as of 2013. In 2013, pipelines transported almost 15 billion barrels of both crude oil and petroleum products, a 6% increase from the previous year. Crude oil transport alone increased by 11.3%, and over the past 5 years, there is a 19.4% increase of barrels delivered by transmission pipelines, which equates to almost 1.4 billion barrels. The almost 15 billion barrels delivered also includes petroleum products, which increased 0.4% from 2012 and 1.2% the past 5 years. This upward shift from 2009 is a growth of approximately 80.8 million barrels of petroleum products, which include refined products like gasoline, jet fuel, and diesel, as well as natural gas liquids (NGLs), such as propane and ethane. Accordingly, the increase in volume has led to a change in mileage. The total of the pipelines stretched across the U.S. in 2013 equals approximately 192,396 miles, which breaks down to about 61,000 miles for crude oil, approximately 63,500 miles for refined products, and the remainder for NGLs. This amount increased 3.3% from 2012 and rose 9.3% over the past 5 years. The greatest increase since 2009 is in crude oil pipelines, which has shifted upward 15.5%, or 8,174 miles. In the same period, there has also been a 2.8% rise in refined product pipelines, which is 1,729 miles, and a 9.6% growth, or 5,509 miles, in NGLs pipelines. Similar to the trend of crude oil, natural gas infrastructure investments prior to 2008 focused on handling imported liquefied natural gas (LNG), which was a major source of the increasing natural gas electricity production. However, this tactic was adjusted as shale plays, like the Marcellus field, combined with improved well drilling and completion techniques began to produce large amounts of natural gas. Power plants and residential consumers were satisfied with this domestic natural gas, and there was no longer a need for imports. In 2013, there was approximately 320,000 miles of gas transmission and gathering piping. This mileage divides into 298,306 miles of on-shore transmission piping, 4,520 miles of off-shore transmission piping, 11,307 miles of on-shore gathering piping, and 6,128 miles of off-shore gathering piping. 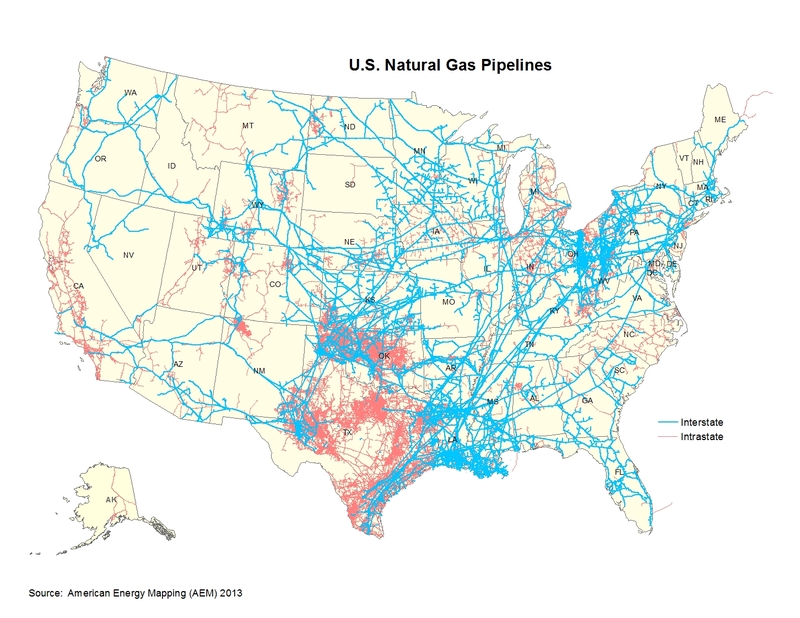 Natural gas transmission piping can be interstate or intrastate, and it moves the product from a gathering line or storage location to a distribution point or another storage location. There is both on-shore and off-shore transmission piping. Gathering piping moves the product from the production facility to a transmission line, and it can also be on-shore or off-shore. These definitions are also similar for liquids pipelines. The growth in natural gas pipeline mileage over the past years has been minimal, mostly due to the low cost of natural gas, but recent production activity and possible export ability is warranting the need for more natural gas piping. As evident from the information above, there are numerous natural gas pipeline projects projected. These pipelines will play a critical role, as there is a projected trend for the US to consume 30% more natural gas, either in residences or natural gas power plants, between 2014 and 2025. Also, if LNG exports are allowed, this infrastructure will move products from the producing areas to the LNG facilities and terminals. 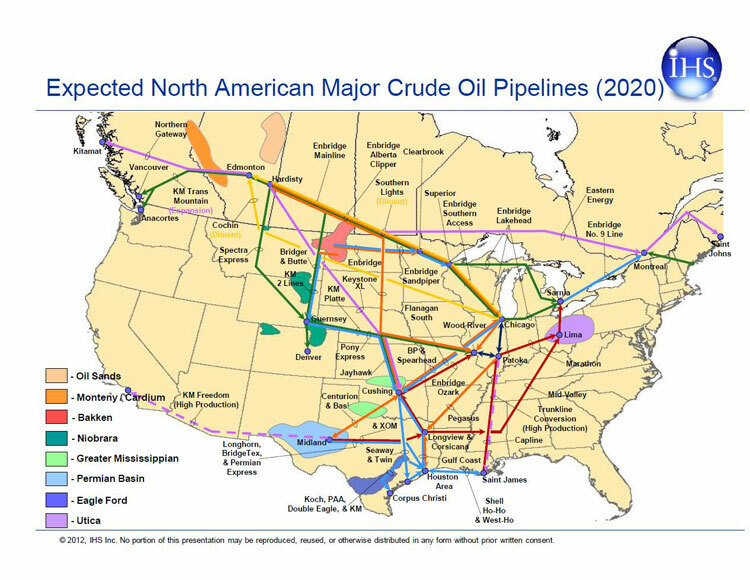 The expected crude oil pipelines shown on these maps will be critical to supplying America’s refineries with the natural resources needed to provide consumers with gasoline, jet fuel, and diesel. The pipeline construction will focus on moving products from the north to the south through the mid continent. There will also be a great deal of construction on pipelines from west Texas to the east, either to the refineries in Louisiana or elsewhere along the Gulf Coast. Pipelines from other production areas will join these two corridors to help move product around the country. In addition to crude oil, there is an expected increase in the construction of NGL pipelines. This resource is becoming more prevalent due to production in the Eagle Ford and Bakken regions. In the upcoming years, capital will likely be invested in NGL marine terminals on the Gulf Coast and the Delaware River. Infrastructure will be needed to bring the NGLs from the new production areas, as well as the traditional Rocky Mountains production region, to these new terminals.